Sit in the center of the plate facing out with legs apart. Place a pillow under your buttocks for added comfort. Allow your upper body to lean forward. Rest your elbows on your knees or place your hands on the floor in front of you for added stability and comfort. 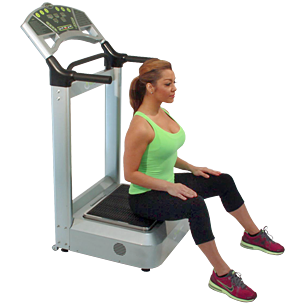 You should feel a relaxing vibration in the back, hip, and thigh areas.